Yesterday we learned that Eastman Kodak filed for Chapter 11 Bankruptcy. This sad day had been coming for a while. It wasn’t a huge surprise to anyone really. Yet for those of us who found our passion and learned our craft of photography during the film era, it is still a shock. I learned this factoid also yesterday while watching Erin Burnett on CNN in a segment dedicated to the news about Eastman Kodak. It did surprise me, and I doubt this fascinating statistic could have been achieved just with digicam and dSLR use only, although there are plenty out there now. I believe it reveals how pervasive the cell phone camera has become in everyday life and that the single-purpose digicam itself is also a product category in decline. As I watch today’s teenagers and 20-somethings go about their daily lives, I see that they not only carry smartphones (mainly) with them all the time; these devices are more often in their hands than in their pockets. So, they are usually ready at a moment’s notice to capture scenes which are often lively, entertaining, curious, and completely candid. I hate to admit it, but this always-ready always-on easy-share picture taking capability lends itself to great photography better than film could ever manage. And that reality speaks to the very core of Kodak’s difficulties. Film went away way too fast, and Kodak’s business managers couldn’t find ways to extract similar profits from digital photography that were to be had with traditional film and paper chemistry. The photo above was taken yesterday with an iPhone 4 by Samantha Borges here at the Hyde House in Lee, Massachusetts. Sam and her boyfriend, Nick Dienst (plus their dog, Townes, and cat, Jazzy), are currently residents at the Hyde House. They are helping us tend to the considerable chores required by a large old historic wood frame house in the Berkshires. Sam “processed” the photo with an iPhone App (“Instagram”, I believe) to create the vignette and square format plus black-border effect before emailing it to me. My own sense is that the average consumer now sees relatively little need to make hard copy prints. This conclusion does not bode well for Kodak coming out of bankruptcy or for that matter Aardenburg Imaging & Archives continuing our digital print research. Less and less people still care about printmaking and print permanence. Where hardcopy prints were essential in the 19th and 20th century to view human-readable photographs the hard copy print has now became entirely optional in just the first few years of the 21st century. With respect to print permanence the argument I hear most often goes something like “I don’t care if the print fades, I can always reprint from the digital file when I want to “. Yet there will be common occurrences where file finding and reprinting won’t be as easy as it sounds. Also, for most consumers digital picture quality merely needs to be good enough to quickly upload to Facebook, Flickr, etc. I observe that today’s photo consumers seems to be documenting their world more with an “instant replay” mindset to share with friends and family rather than with consideration for the image as a long term keepsake. This trend represents a dramatic departure from traditional thinking about the role of photographs in our lives. 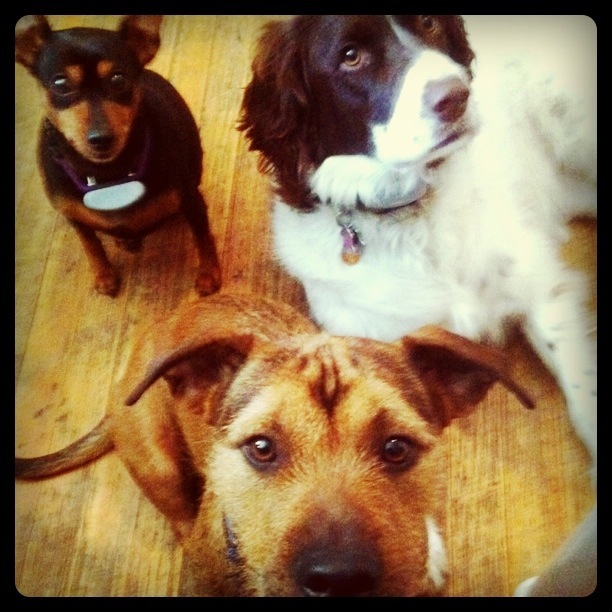 I really like Sam’s photo of the “Hyde House Gang” of dog critters. However lacking the image quality of current cell phone cameras, I often find that cell phone images produce whimsical, artistic renderings that are just begging to be printed on a high quality fine art watercolor paper using inkjet technology. As technically savvy as most young folks are today, many are unaware that most mobile email apps and photo sharing websites heavily downsample the camera original image data. That happened in the file I received via email from Sam. The emailed photo (displayed here neither edited nor resized) is only 612×612 pixels, but there’s a full 5 megapixel image still on Sam’s iPhone. I need to go retrieve it from Sam’s iPhone in order to print one copy for the Aardenburg Archives and one for Sam and Nick on a fine art watercolor paper with pigmented inks. The digital file may last indefinitely, or it may not, but the prints will be physical objects and keepsakes which I believe are more likely to be passed to future generations. Let us hope that Eastman Kodak can emerge from Chapter 11 with a strong business plan to remain a household name for those future generations.